The “Pocket Doc” is designed to be helpful to professionals in the fields of social work, law, and law enforcement who encounter elder abuse. This sturdy little book is a guide to common geriatric disorders and medications. It's like having a doctor in your pocket! Geriatricians Lisa M. Gibbs, M.D., Laura Mosqueda, M.D., and Steven Tam, M.D. ; neuropsychologist Bonnie Olsen, Ph.D., and gero-pharmacist Bradley Williams, Pharm.D., CGP, collaborated with other professionals from University of California, Irvine Division of Geriatric Medicine & Gerontology to give an overview of what we believe are the most common medical conditions facing the older adult population. 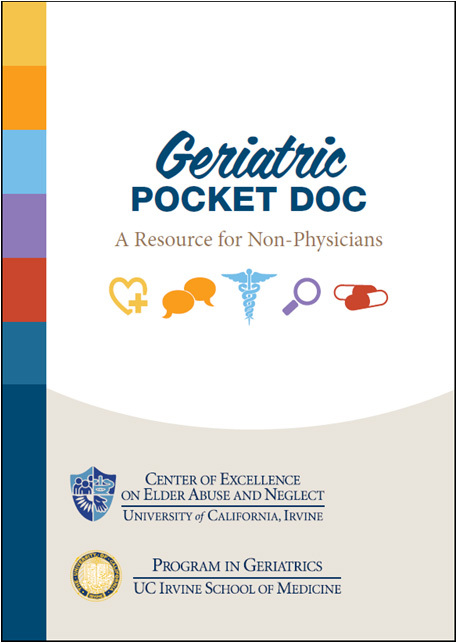 The Geriatric Pocket Doc addresses commonly asked questions about normal aging, and provides warning signs of elder abuse and neglect. It includes many helpful illustrations and charts. Paperback version, grayscale interior, list price: $11.50 + tax and shipping. Prices may vary. Kindle Edition for e-readers, list price: $8.99, Prices may vary. Questions about ordering the Pocket Doc please send an email to Lisa Peck at lcpeck@uci.edu with your inquiry or request. Please send comments, suggestions, and inquiries by e-mail using the Contact Us feature.